This Summer Squash & Ricotta Galette with Sage Brown Butter is my ode to summer. How are you celebrating summer? For me, the answer is simple: food. It’s always food, isn’t it? While fall is my favorite season, summer is my favorite food season. It’s all about fresh garden veggies, farmers’ market finds, and simplicity. This season, I can’t get enough summer squash. I load my market bag every Saturday when I visit my favorite farmers’ market. It’s great simply grilled with a little olive oil, salt, and pepper, or you can get a little more creative and stuff it with other various ingredients, but the method I’m smitten with this year is layering it on top of a flaky pie crust with creamy ricotta cheese and brown butter sage sauce. Whenever I can get away with adding double the cheese, I take complete advantage of the situation. 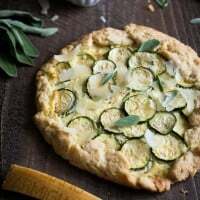 This Summer Squash & Ricotta Galette with Sage Brown Butter uses a combination of creamy ricotta and sharp, nutty Parmigiano Reggiano cheese. Parmigiano Reggiano is exclusively from Italy and contains only 3 ingredients: milk, salt, and rennet. It never contains additives of any kind. To ensure you’re buying authentic Parmigiano Reggiano, look for pinhole dots on the rind. If you’re unsure you’re getting the real deal, ask your cheesemonger for assistance. To make the dough, add flour, baking powder, and salt to the bowl of a food processor. Pulse to combine. Add the butter and pulse until the butter is the size of peas. With the motor running, add the water through the feed tube; continue to pulse until combined. The mixture will remain crumbly. Transfer the dough onto a lightly floured surface. Press the dough together until if forms a ball. Wrap in plastic wrap and refrigerate for 1 hour. To make the sage brown butter, add the butter to a small saucepan. Melt the butter over medium heat in a saucepan. Add the sage leaves and continue to cook the butter, whisking occasionally to prevent burning, until the butter is dark golden brown in color and smells nutty. Remove from the heat and set aside. To make the galette, unwrap the dough and roll into a 12-inch circle on a lightly floured surface. Place dough on a baking sheet lined with parchment paper. In a small bowl, combine ricotta cheese, grated Parmigiano Reggiano, Italian seasoning, garlic, salt, pepper, lemon zest, lemon juice, and egg yolk. Whisk to combine. Spread a thick layer of the ricotta mixture over dough, leaving a 2-inch border. Arrange the zucchini slices, slightly overlapping, in a circular pattern over ricotta mixture.Fold edges of dough toward center, pressing gently to seal (dough will only partially cover the zucchini). Brush the zucchini and dough with the sage brown butter. Sprinkle the top of the zucchini with a pinch of kosher salt. Bake at 400° for 40 minutes or until golden brown. Cool for 5 minutes; sprinkle with fat shavings of Parmigiano Reggiano cheese. Cool for an additional 15 minutes before cutting into 4 large slices. Disclosure: This recipe was developed for the lovely folks at Parmigiano Reggiano. All opinions are my own. Thank you for supporting my recipes and site while I work with brands I adore.